Maxine Linehan has one of the most beautiful voices I've heard! The minute I was introduced to Maxine, I fell in love with her. From U2's "One" to Martina McBride's "In My Daughter's Eyes" to Petula Clark's "Downtown," Maxine really knows how to put her stamp on a song. She makes them sound like they were written just for her! 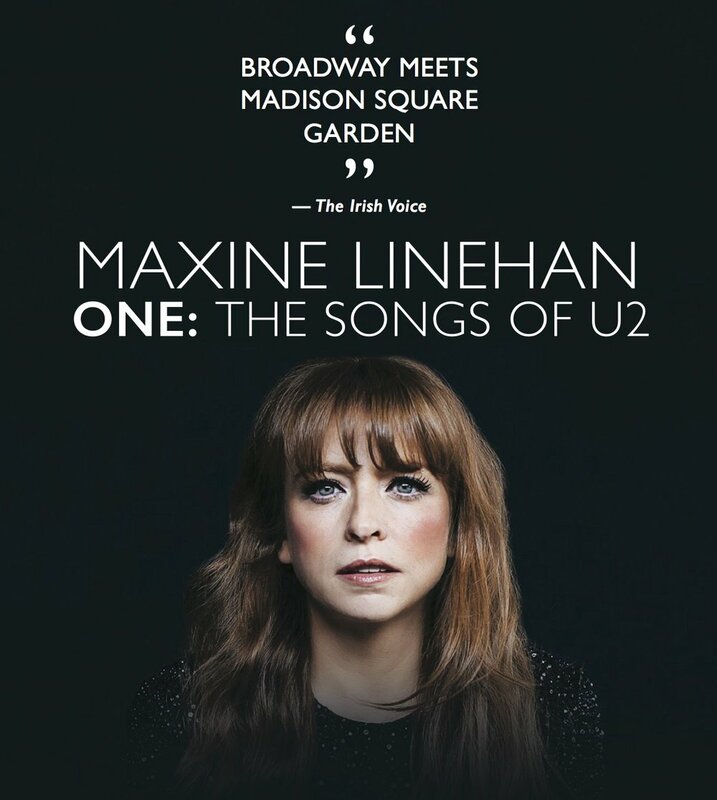 It's been two years since my last interview with Maxine, so believe me, it's wonderful to catch up with her as she readies to hit the Feinstein's/54 Below stage this fall with her show One: The Songs of U2. The extraordinary songs written by Bono and U2 find a new voice in a concert that holds to the beautiful melodies, while bringing the lyrics forward into a fresh light. Accompanied by piano, cello, violin, bass, and drums, Maxine will continue her mission of providing audiences with the unexpected experience of hearing U2's famous songs as if for the first time - while staying true to the heart and soul of each time-honored hit. One: The Songs of U2 will be play Feinstein's/54 Below (254 West 54th Street, between Broadway & 8th Avenue) on September 15 & October 13. Click here for tickets! For more on Maxine be sure to visit http://maxinelinehan.com and follow her on Facebook, Twitter, Instagram, and YouTube! 1. It's so great to catch up with you! Last time we chatted was in 2015 when you were releasing your album Beautiful Songs. What do you feel has changed the most for you in the past two years since we last spoke? I love chatting with you Adam, and spinning with you! Beautiful Songs was an exciting project and the album has been so well received, beyond my expectations - it even became a top 10 pick by USA Today. That album and show was really the catalyst for what has become a wonderful concert career. The next show we created was What Would Petula Do?, my tribute to Petula Clark. It has travelled the county and last year we took it to Paris’ famed Théâtre du Châtelet where it sold out. At that performance we recorded a live album with an incredible Parisian orchestra which will be released in the Fall. Beautiful Songs also features U2’s "One," which was the first time I had recorded or performed a U2 song, and that led to my asking the question, "Are there more U2 songs that could be given this treatment?" Turns out there were! 2. Now, you are getting ready to return to Feinstein's/54 Below with your show One: The Songs of U2. What made now the right time to perform this show? The songs written by Bono and U2 are extraordinary. Many of my fans who have heard me sing The American Songbook are not too familiar with the songbook of the boys from Dublin. Bringing that music to a different audience has been very exciting. We performed the show for the first time as concert with many performers and a fundraiser for BCEFA, and the response really surprised me. The audience fell in love with the profound lyrics combined with the beautiful new orchestrations. As I developed the show further, I found new meaning and emotion in these classic songs. Bono doesn’t write fluff, he’s one of the greatest lyricists of our time, and when you shine a light on his lyrics they are very powerful. It’s amazing to me that songs they wrote in the 1980’s about war, about taking care of each other, are more relevant today than ever! Our world is chaotic right now and to come together with music, spreading words of love and forgiveness is essential. 3. Let's go back to the beginning for a moment. When did you become a U2 fan? What was it about that particular song/time that made you go, this is a group, I will like for years to come? Growing up in Ireland it was easy to become a U2 fan. As a nation, we are exceedingly proud of these four Irish men who changed the face of music. Of course today it’s not only their music that is extraordinary, it’s also the longevity. I just saw The Joshua Tree 30th anniversary tour and they are as exciting and relevant today as they were 30 years ago! As I mentioned, recording "One" on Beautiful Songs was a tipping point. The potency of that song performed live is outstanding. 4. How long did it take you to create this show...from idea to inception? The show developed from a group concert to a solo show over a two year period. I have collaborated with Scott Siegel (Director) and Ryan Shirar (Music Director) on all my concerts and together I believe we’ve created something very unique with this show. 5. What was the hardest part about putting this show together and what was the most fun? The hardest part was selecting the songs. With such a vast and brilliant songbook, it was very difficult to select just 14 or 15 songs. The most fun for me was hearing Ryan’s orchestrations played by some of my favorite musicians for the first time. I was reduced to tears. Tears of joy! 6. With U2's immense catalog of music, how did you narrow down which songs you wanted to perform? Well, as I said, it was the most challenging part. However, I need to sing songs that resonate with me on a deep personal level so that was a helpful way to narrow down the song choices. I don’t think I can bring anything new or interesting to "Mysterious Ways" or "Lemon," but I sure do connect with "One" and "Bad!" 7. For those who are big U2 fans, why should they come to see you sing their music? How do you think you'll win them over? As some critics have said, it’s U2 like you’ve never heard them before. I’m no Bono, no one ever will be! With all my tribute shows I’m very careful to interpret, not impersonate. I take these incredible U2 songs and present them through my voice, my experiences and my emotions. One of the things I find most remarkable about the reception this show has received is the support of diehard U2 fans! When I see these fan clubs and social media groups talk about how much they love my interpretations it validates me. I’m so grateful to all the U2 fans for that support. 8. How do you feel your musical style or interpretation of music is similar to theirs to make you a premiere interpreter? Deep, compelling lyrics are my favorite. Connecting with an audience through the great lyrics of a song is one of the most powerful experiences a singer can have. U2 has always done that, and I continue to strive to do that with every song I sing. 9. One of my favorite U2 songs is "I Still Haven't Found What I'm Looking For." What is something you are still searching for? I find great joy in interpreting songs, from Gershwin to U2 and everything in between. The next chapter for me is about finding my own original voice. Songs that come from me. I have started to explore what that is and next year I will be teaming up with some remarkable writers to help me find that voice. So stay tuned! 10. Another one of their songs is "Last Night On Earth." If this was your last night on earth, how would you spend it? Sitting around the fire pit in my back garden with my husband and children, sipping wine and listening to U2! 11. If, during one of your shows, Bono jumped up and said, let's sing a duet together, your choice. Which song would you choose? "One." No contest! After I picked myself up off the floor of course! International concert and recording artist Maxine Linehan has been hailed as an incredible talent by the thousands of audiences who have witnessed her performances. Maxine made her Paris debut at Théâtre du Châtelet with the wildly acclaimed What Would Petula Do?, a tribute to Petula Clark. As a concert performer she has enraptured crowds in venues large and small, from New York’s Lincoln Center and The Town Hall, to Feinstein’s/54 Below and Birdland, to cities across America. Her ability to emotionally engage throughout a stunning vocal performance is unparalleled. Her solo show An American Journey, a story of immigration told through song, sold out its New York City run, and led to a live album. Maxine's show Beautiful Songs (and album of the same name) also had a sold out run and received rave reviews from The New York Times, USA Today and The Huffington Post. The most recent addition to her three albums, Beautiful Songs, What Would Petula Do?, and An American Journey, is a single of U2’s "One." A live album of What Would Petula Do? at Théâtre du Châtelet drops in the Spring of 2017. A Barrister by training, Linehan studied at The Inns of Court School of Law in London, The London Academy of Music and Dramatic Art and is a member of Actors’ Equity. She lives in Vermont and New York City with her husband and two children. Sep 7 Call Answered: Aliyah Moulden: "The Voice" & Netflix's "Anastasia: Once Upon A Time"